Gunong Rinjani National Park is slightly more than half the size of Singapore’s 716 square kilometres. The park is amazing and beautiful with a variety of vegetation and interesting geographical features from caldera-lake and hot springs, to active volcanoes and a recently formed new mountain; from grasslands to alpine and equatorial forest. The air is fresh and the views awe-inspiring. The sunrise and sunsets are stunning. It is a national treasure to be preserved and enjoyed for generations to come. It is God’s gift to Indonesia to be treasured and managed well so that all can enjoy and give praise to the Creator. Yet during this trek I was appalled that this rare natural beautiful park is marred by litter. Litter of all kinds. There were paper, plastics, and even human excrement. Sweet wrappers, plastic water bottles, paper, empty food containers, plastic bags and paper can be seen every 500 metres along the route. 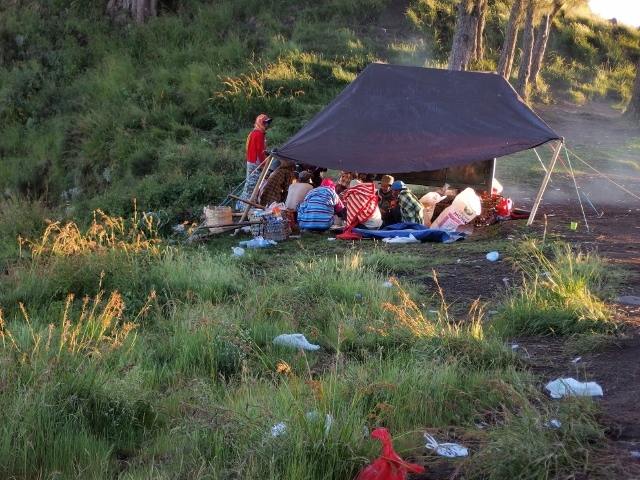 The litter was concentrated where the camps were set up but much lesser along the trekking paths. They were an eyesore. It marred what God has made and given for people to enjoy. It assaulted my senses; it stirred up anger and disgust. And this is not my country. I am sure there are many Indonesians who are angry with this too. One of my friends said, Mt Ophir used to be as dirty. But now the mountain is clean. The park officials have taken action. One of them is to insist that people who climb pay a money deposit and can claim it back only if they show proof they have brought back litter they were responsible for. How true this is I do not know, as I have not been there in the past nor more recently after the changes. But this was what I heard. If Malaysia boleh, then Indonesia boleh. I also understand that local guides and porters make regular trips to pick up litter but I suspect this is not true. I heard that Singaporeans organize two trips each year where scores of young adults climb Rinjani to pick up litter along the way to bring back. How true this is I do not know but that was what the guide told me when I asked whether efforts have been made to clean the park. It’s obvious more can be done. I wish for Rinjani what I saw at Kinabalu – a relatively clean park for all to enjoy. I wish for Rinjani what I saw in Nepal. It can be kept relatively litter free. It is not impossible. So please when you do your treks keep all litter with you till you return back to the villages for proper disposal. The plastic wrapper of your energy bar, chocolate or sweets can be kept in your pocket. The water bottle can be kept in your backpack. Be responsible for your own trash. This will help keep other people’s land clean and litter free and later generations can enjoy it too. Hi Sarah, Nice blog. You did well summiting and I am glad you enjoyed your trek and kept your focus on the climb. Previous Previous post: Mt Rinjani vs Mt Kinabalu: which is tougher?